(Photo: REUTERS / Soe Zeya Tun)Rohingya Muslims attend a wrestling festival at Kyaukpannu village in Maungdaw, northern Rakhine state, June 6, 2014. Since international aid groups were forced out of the Rakhine area in February and March, members of the minority Muslim Rohingya community who relied on them say basic health care services have all but disappeared. Worst affected are those in Northern Rakhine State (NRS), home to most of Myanmar's 1.3 million Rohingya who are stalked by sickness and malnourishment and as yet untouched by reforms under a semi-civilian government which took power in 2011. Buddhist aid workers in Myanmar who are helping the country's beleaguered Rohingya Muslim group are facing a backlash from their own community, so they do not openly show the work they are doing. Soe Aung● who works for an international aid agency in his hometown of Sittwe, the capital of Myanmar's Rakhine State told IRIN, the news agency that covers humanitarian issues and emergencies, that it's a good job. Yet he isn't eager to discuss it in a public setting or outside his close circle of friends and family. That's because his agency helps Rohingya Muslims. "I stay low-profile here," said Soe Aung. "In conversations, in the tea shop, I don't talk about it and I don't argue with local people." Up to 69 members of what Myanmar's government says are members of a Rohingya Muslim militant group and 17 members of the security forces have been killed in an escalation of fighting in ethnically divided Rakhine State, the army said Nov. 15. The killing is the most serious since hundreds of people were killed in communal clashes in Rakhine in 2012, Reuter's news agency is reporting. The death toll, announced in the State-owned Global New Light of Myanmar daily newspaper, was significantly higher than that reported by State media at the weekend. The announcement came as former United Nations chief Kofi Annan, who chairs a commission on resolving Rakhine's problems, expressed concern at the upsurge in violence. Soe Aung is like most people in the area, a Rakhine, one of Myanmar's officially recognized ethnic groups who are Buddhist, which is the majority religion nationwide. Muslims in the state make up the second-largest religious group there and mostly identify as Rohingya. The 1.1 million Rohingya are not officially recognized as one of Myanmar's 135 "national races" and are subject to apartheid-like restrictions, most of them denied citizenship. Rohingya Muslims are denied citizenship and many of Myanmar's majority Buddhists regard them as illegal immigrants from Bangladesh. The Rohingya face restrictions on travel and access to healthcare. Many were dependent on regular nutritional and medical aid long before the outbreak of fighting in October. In 2012 tensions between the two communities turned violent and hundreds of people were killed, most of them Rohingya. 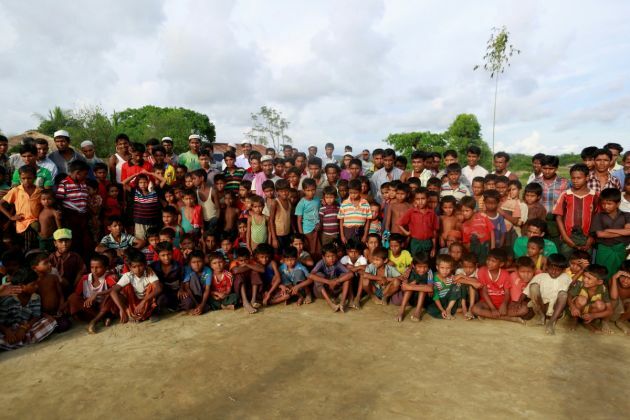 Around 140,000 people were forced out of their communities and close to 120,000 people remain in camps around Sittwe today, almost all of them Rohingya. Follow the eruption of the 2012 violence international aid agencies arrived to deal with the humanitarian crisis, and there was a high demand for local staff. Drawn by bigger salaries and the opportunity to do interesting, challenging work, many Rakhine Buddhists applied and were hired. But IRIN reports their new work drew criticism from members of their local communities, who came to resent the presence of international organizations due to a perception that they are on the "side" of the Rohingya. That recurring tension between international NGOs and some in the Rakhine community over a number of years is said to have been stoked often by Buddhist nationalist monks. In 2014, Rakhine Buddhists rioted in Sittwe, damaging the offices of a German medical charity, Malteser International, as well as some UN agencies. The tension has intensified again in recent weeks during military operations in Maungdaw, a township on the frontier with Bangladesh. The government in Myanmar accuses members of the Rohingya community for carrying out lethal attacks on border police posts, so the army is now hunting down a militant group. IRIN cites Gabrielle Aron, the director of programs for the Collaborative for Development Action, the author of a recent report on conflict sensitivity in Rakhine that touches on the relationship between local aid workers and their communities. She found that Rakhine NGO staff came under pressure. "Given the perception among much of the ethnic Rakhine community that most international agencies primarily support the Muslim population, working for these agencies as an ethnic Rakhine person can be seen as a betrayal, given the intercommunal tensions," said Aron. "They are in a tough position. Many staff of international agencies are genuinely dedicated to the work that they do, but they have a difficult line to walk." ●IRIN changed the names of Rakhine aid workers for their protection.